In the past few days, we have successfully proven that when the provincial government attempts to savage our economy with cuts to those on low incomes, students, the environment, public services and the film industry, it will not pass without a fight. From flash street parties to MLA pickets and rallies of hundreds of people, we have made sure there will be no peace if the government tries to make us shoulder the burden for an imaginary “crisis” which is not our making. 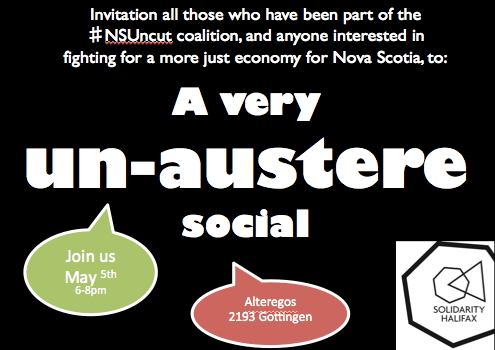 Solidarity Halifax would like to invite all those who have been part of the ♯NSuncut coalition, and anyone interested in continuing to fight for a more just economic policy for Nova Scotia, to an event to celebrate our tireless week of actions and discuss paths to keep working together for a non-austere future. Join us on Tuesday May 5th at Alteregos, on 2193 Gottingen to keep our campaign moving forward. Hot drinks and beer will be available, and food will be provided.